For surface cleaning of artificial turf surfaces. The TERRA CLEAN 100 is an effective entry level cleaner/ collector. Land driven, the Terra Clean 100 can be towed behind a wide range of utility vehicles from 12 hp without the need for a PTO. As no hydraulics or electrics are required it is favoured by those clubs or organisations with a small number of pitches to maintain. Readily manoeuvrable and at just 1.2m wide it is sufficiently narrow to pass through the gates of most facilities yet wide enough to cover a full size pitch quickly. With a four brush rotor, it collects dirt, debris and some rubber crumb onto a mechanical vibrating screen. Next it efficiently separates the debris from the crumb rubber before returning infill back to the playing surface and retaining the debris in the 50 litre hopper. The windows of hopper cover allow the operator to see at a glance just how much debris has been picked from the surface. After use the drive can be disengaged so it is easily transported on and off the playing surface and from site to site. Options: ball hitch, rake complete, rear brush, additional screens. 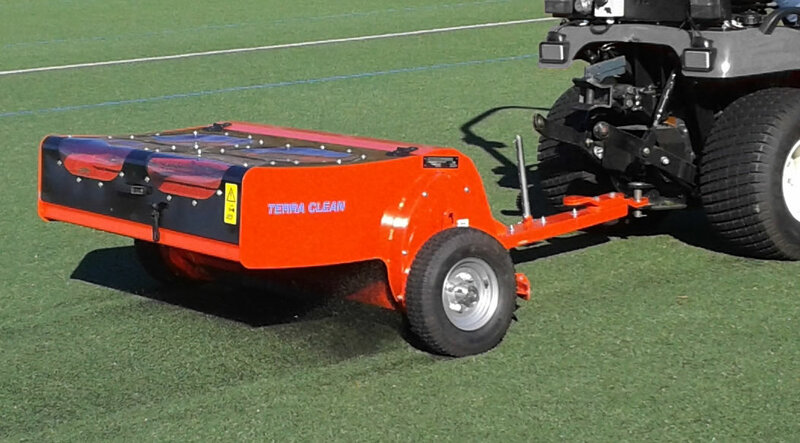 If you are interested in our TERRA CLEAN 100 use the quick enquiry form below.